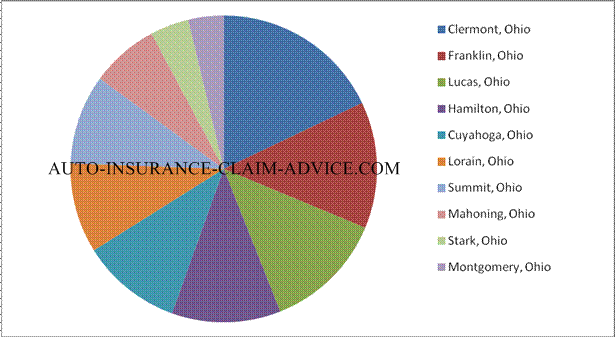 We looked at Ohio injury settlements and jury awards. The highest, average and median jury awards for different counties were found, but we cannot determine whether these data are precise because there are most insurance companies keep their data confidential. 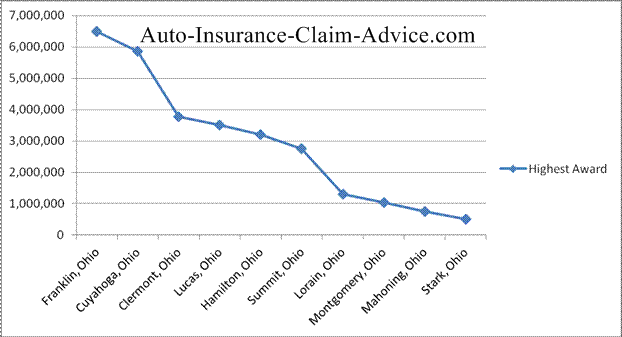 In Ohio, we studied the settlement trends in the following counties and districts: Cuyahoga, Franklin, Hamilton, Summit, Montgomery, Lucas, Lorain, Mahoning, Stark, and Clermont. Melisa Rizer v. Mooney Airplace Corp., et al. Ohio Common Pleas. Award by Settlement: $15,000,000. Southard v. Whetstone Care Center. Ohio Common Pleas. Award by Jury: $6,500,000. Jane Doe v. Anonymous Doctor. Ohio Common Pleas. Award by Settlement: $5,850,000. Estate of Margaret Patton and estate of Schuyler Wood v. Darling International, Inc. and james B. Holland; Undercar Specialty Warehouse and Frederick Woods. Ohio Common Pleas. Award by Settlement: $4,625,000. Angela Lowe v. Cuyahoga County/Board of Commissioners; Gerald T. Mcfaul, Cuyahoga County Sheriff; Midwest Medical Staffing, Inc., et al. Northern District of Ohio. Award by Settlement: $4,000,000. Brain Wallace v. Biswanath Halder and Case Western Reserve University, et al. Ohio Common Pleas. Award by Jury: $3,800,000. Anita Mugrage, Larry Mugrage, Sr., et al. v. Charles Martin. Ohio Common Pleas. Award by Bench: $3,784,957. Sandra Romig v. Worthington Industries. Ohio Common Pleas. Award by Jury: $3,661,750. Susan Lowe v. Promedica, Central Physicians, et al. Ohio Common Pleas. Award by Jury: $3,511,000. 10. Catherine M. Donohoe v. Kenny Huston Co. Ohio Common Pleas. Award by Settlement: $3,250,000. 11. Rice v. Neal. Ohio Common Pleas. Award by Settlement: $3,249,000. 12. Kosciuk v. Sw. Ohio Reg'l Transit Auth. Ohio Common Pleas. Award by Jury: $3,208,493. 13. Sally Kegley v. Ohio Ski Slopes, Inc. Ohio Common Pleas. Award by Jury: $2,788,575. 14. Beverly Novak v. Robert Studebaker, Tri County Area Services, QC Fabrication Inc. and QC Enterprises Inc. Ohio Common Pleas. Award by Jury: $2,761,753. 15. Estate of Deborah Kirk v. Franklin County Sheriff's Office. Ohio Common Pleas. Award by Jury: $2,725,000.